After a couple years of successful business I began to broaden my guide service. 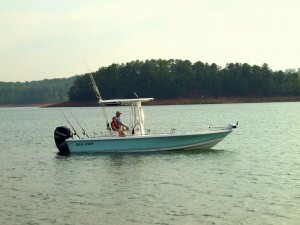 I started guiding World Class Brown Trout, Spotted Bass, and Walleye trips on Lakes Burton, Seed and Rabun. My business has really grown over the last couple of years; more than I expected. I have been fortunate enough to guide a couple of popular college ball coaches and a few television celebrities. My clients are from various regions of the United States and other countries ranging in ages 5 to 85. I am very professional and treat my customers with the utmost respect. I enjoy meeting new people every day!!! Most important “I LOVE FISHING”! Come enjoy a trip with us.